Happy Veterans Day! To all those that serve this country in whatever means you do - thank you for all you do and I know that one day of thanks isn't nearly enough. I have been fortunate enough to have military servicemen among my life, not only in my family but circle of friends as well. It helps define the word freedom and hero. Each time I see them - I thank them for their service. It brings alittle sadness to my heart on days like today- with remembering all those that have lost their life for us. So thank you again to all the Service members & Veterans out there! Today I have the medallion in Not so Navy for you. I really need to use this stamp more, the possibilities are endless, and truely its just classy. I dressed it up with some pearls and added pearls to the top that I colored Not So Navy. 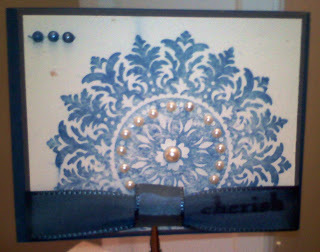 I stamped Cherish on the ribbon, however its more visible IRL then here.